Although a traditional neckbeard is facial hair that grows from below the chin and around the neck, in computer and internet culture it refers to a person with a highly advanced skillset that is probably fairly unique. Although "neckbeard" is sometimes used as a term of endearment, and may also be derogatory in nature (the context of its usage is important), this slang form is not used to identify people in positions of power or enlightened leadership. In the context of endearment, it is a compliment that signifies a great deal of respect, and is also often an endorsement of how hard a person worked to deserve such a title. In the derogatory form, it is usually providing sarcastic or otherwise negative commentary about the way someone dresses (an ad hominem attack), and hints at the person failing miserably when trying to appear knowledgable. This usually isn't a very flattering image since neckbeards tend to appear out-of-place on scrawny looking individuals. 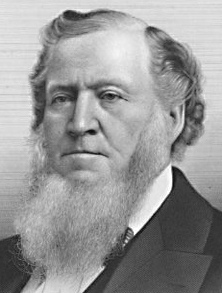 A full neckbeard, such as that featured by Mr. Brigham Young (c. 1850) as pictured here (to the right-hand side), protruding from the bottom of the chin, is a common type of neckbeard that can imply great wisdom and command respect, especially when its wearer is in a position of leadership. The neckbeard style is also fairly popular among many lumberjacks and motorcyclists for practical reasons, mainly because it conveniently provides protection against cold weather and bug bites while working outdoors in forests felling and processing trees or travelling on two- or three-wheeled vehicles (such as motorcycles or ATVs).